Decorating for spring brings such optimism, color, and freshness. Today, I am sharing some of the details around this lovely, inexpensive centerpiece I designed for a Mother’s Day Luncheon. It was super easy and there are so many other variations you could create using the same concept for multiple applications, events or seasons. Stay tuned to the end of the post for lots of suggestions!! Spring is finally in full bloom here! This is most assuredly one of my favorite times of the year. The trees are popping with new leaves, the flowers are starting to bloom and the days are longer. Oh, happy days! I love using natural elements from the great outdoors to help create a fresh, clean look. Recently, I shared two new posts offering some spring decor designing ideas and a new spring table setting that I created to celebrate Mother’s Day with my mom on her visit here this past week. To see the full posts, click on the links below. For this post, I am covering a few more details and suggestions about the centerpiece which seems to have been a big hit! The total cost of this centerpiece was only $56.00!! Eight cylinder vases (from Dollar Tree) @$1.00 each, six bags of limes (from Trader Joe’s) @$1.99 each and six bundles of hydrangeas (from Trader Joe’s) @ $5.99 each. So, that is basically $7.00 per arrangement! Plus, it can be scaled up or down depending on the size of your table or event. Start with choosing any clear container. I have a sizeable collection of these simple 9″ glass cylinder vases from the Dollar Tree and they worked perfectly. They also have a shorter size if that works better for you. You could really also use any shape of a container. I was interested in creating a long, linear look, so that is why I went with a cylinder. Next, choose a vase filler that coordinates with your color scheme. 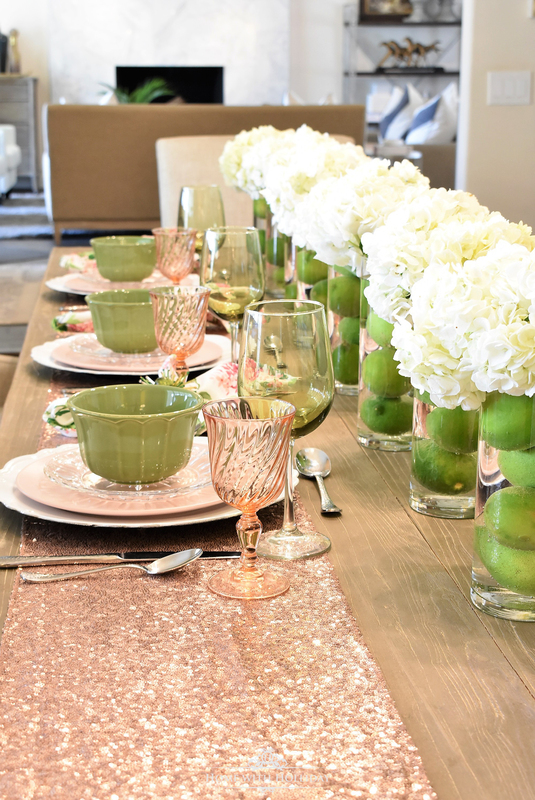 In this case, the limes brought out the green tones in the napkins I chose for this table setting. They are organic and there are so many things you do with them once the flowers expire (Key Lime Pie, Limeade, etc.!!). I provided several of my favorite lime recipes in this previous post. Finally, select a single flower you would like to feature. You could, of course, use multiple flowers here, but I think using just one type adds to the drama of the centerpiece. There are so many beautiful varieties of this look that you can create yourself. Consider some of these combinations. I like choosing organic fillers that can be reused. For Spring (Easter, Mother’s Day, Cinco de Mayo or Derby Day)…lemons with white or pink tulips; limes with pink roses or peonies; tangerines or “Cuties” with white stock; strawberries with red roses or red Gerber daisies; lemons with red tulips. For Summer (Memorial Day, July 4th)…strawberries with blue or white hydrangeas; blueberries with red roses, tulips or daisies. For Fall (Oktoberfest, Halloween, Thanksgiving)…tangerines or “Cuties” with fall colored flowers; unshelled walnuts with orange roses or astrameria; plums or red grapes with any fall flowers. For Winter (Christmas, New Year’s Eve, Valentine’s Day)…Limes with red roses or carnations; green apples or pears with red or white poinsettias; strawberries or red apples with winter greenery. Thank you for stopping by today! I hope this post gave you a few new ideas or inspirations for creating a dramatic, inexpensive centerpiece. Please consider subscribing to my blog so that you can recieve instant updates of new posts via email. For more inspiration, you can go to my Pinterest page for thousands of pins on 80+ topics! Beautiful Holly and great tips and ideas for a beautiful table! Brava! !